Charcuterie board + cheese board... sounds fancy but it's just a large plate or board filled with meats, cheeses and crackers for snacking. Processed meats and cheeses obviously aren't healthy for your gut microbiome, so we made it healthy by making it vegan and adding our Cultured Guru Fermented Foods! You always need something tart on a cheese board, so Cultured Guru Pickles and Cultured Guru Kimchi were the perfect additions. Plus, a little probiotic add ins go a long way! The funnest thing about this snack board (besides being healthy) is that you can get REALLY creative with ingredients. Pick and choose which vegan cheeses you prefer and use whatever fruits and veggies are in season! Our favorite vegan cheeses are made by Chao and Follow Your Heart. 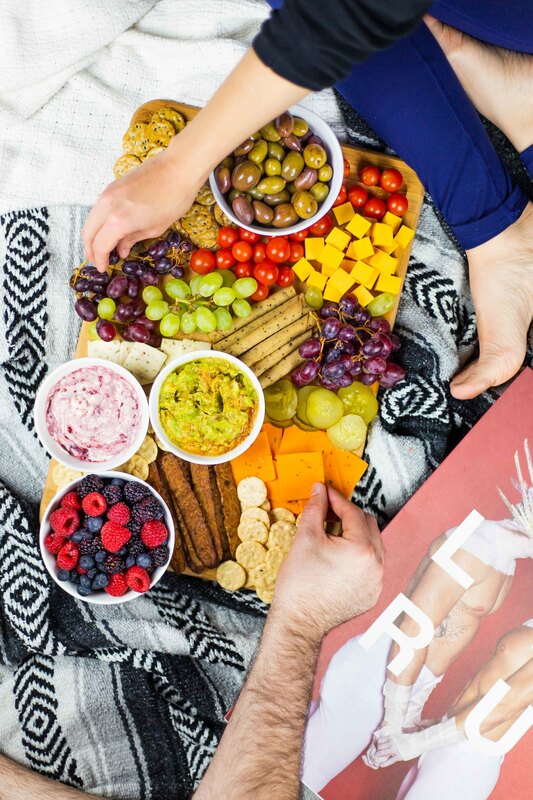 The Ultimate Vegan Snack Board = One Shared With Friends! Okay okay, we've got the snacks, now what about people to share with?! Our friend, founder and creative director of Leur Magazine, Charlie came over. Leur Magazine is a queer focused Southern Arts & Culture magazine based in Baton Rouge, Louisiana. They curate and publish two annual print magazines as well as host local art events and collaborations within our local communities. Scotty and Charlie met in college when they were pursuing the same degree path: digital advertising. Obviously that was the right calling for both of them because Leur and Cultured Guru are beautifully branded, and they are ridiculously talented. Leur even received a 2018 American Advertising Award for Publication Design and Magazine Design. We plan to frame the art from the latest issue of Leur, and display it in our house, because it is BEAUTIFUL. To snag a copy click here. Mix the Cultured Guru Kimchi and the guacamole together. Place everything on a large wooden cutting board. Enjoy good times with friends and eat some gut healthy, planet friendly snacks!